Do you know what time it is? Nope, not the holidays. Nope, not time to get your rear end moving on your crochet Christmas gift list. It’s fruitcake time! Mmmm… I’m eating a slice right now! Love it or hate it. That’s what they say. I used to be a hater. Now I’m a lover. The one above is just plain ol’ Hostess because that’s all I can get my hands on right now. I’m hoping to snag a few of the Claxton Fruitcakes often sold by Civitan groups this time of year. I have exciting news for Ann Page fruitcake lovers! The fruitcakes sold by A&P grocery stores, which are actually called Jane Parker fruitcakes, are now available for purchase online at A&P’s web site. A&P (the Great Atlantic & Pacific Tea Company) began selling their long-beloved fruitcakes online in 2008. When I was growing up in Maryland in the 1970s, we shopped at an A&P grocery store. I didn’t eat fruitcake then, but my parents did, and I remember well shopping with my dad and buying them there. I thought A&P had gone out of business, but it appears that A&P stores are now located in only New York and New Jersey. When I wrote this post about fruitcake in 2004, I didn’t expect that it would be popular for years to come. To my fellow fruitcake lovers, thank you for visiting my blog, and please feel free to leave a comment! 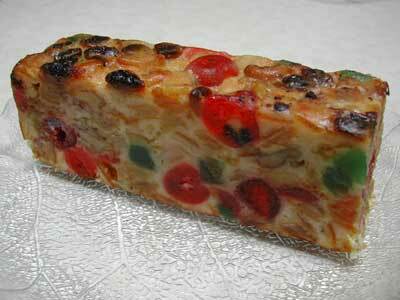 And if you order a Jane Parker fruitcake, I hope you enjoy it and that it is as wonderful you remembered! Disclaimer: I am in no way affiliated with A&P grocery stores and do not receive any income from my links given above to A&P. I’m simply sharing the good fruitcake news! Claxton fruitcakes. Made not too far from here. And did you know fruitcakes freeze well, and those that don’t, soak in rum, then who cares. Will send you one, they are out here already, but need your address. Here in Georgia we have been gettingt hem for about 2 mths and will till weekafter Christmas. Then they do suddenly disappear. I confess, I love fruitcake. I think the green cherries are interesting. I’m glad that my MIL makes a great fruitcake with a starter batter that’s well over 50 years old and loads of fruit and rum–no green cherries, though. I love love LOVE fruitcake! My Grandma makes the best. She bakes loaves and loaves of it, the weekend AFTER Thanksgiving. Whatever batter is left over, she makes into small muffins… we get to sample those – and she tortures us by not letting us get into the rest until Christmas eve. I never understood why people hated it so much. It must be there are some bad storebought ones out there. My mom and grandma make fruitcake for the holidays, and it is just SO GOOD! My FIL begs me every year to get my mom to send him one. So, I guess I lucked out growing up in a good fruitcake family, where I wasn’t spoiled to it by childhood ickiness. I worked in a bakery for a few years and never did learn to like them no matter how many we made. Cranberry-Orange bread, now that’s my holiday bread/cake of choice! My aunt used to bake fruit cake like crazy during the holidays. For years I loved it. I still think fruit cake is pretty, though. My Dad used to get a big fruitcake in a tin every year for Christmas from the company he worked for. I remember they always gave it away to someone else. My Grandma used to make the best fruitcake. She just passed away this year, and it will be the first Christmas without her fruitcake. How sad. When I was growing up (with a fruitcake every year baked by her) I didn’t know there were people who despised it so much! not a fruitcake fan and they are big here in louisiana. my ma makes a mean bourbon nut cake for the holidays and that is great. if you want a fruitcake, email me and i’ll ship one your way! well my sisters and i have a fruitcake we mail around to each other this time of year.. its about ohhhh 10 years old LOL ..
but i am lucky enough to live near the southern supreme fruitcake maker here in NC.. supposed to be the best in the world .. not so sure about that .. but its pretty damned good .. they even had an article done on them in Southern Living magazine that is how good they are !! the best fruit cake i ever received were the ones my mom sent to me while i was in the navy in the mid 50. they came from the a&p brand name ann page i think. hey beat out all the other store bought and home made cakes by far. i still remember how good they were. Count me among the Ann Page fruitcake lovers. This is a great childhood memory. At this time of my life I lived on Long Island and you could get these at the local A&P. I really would love to track down the recipe or someplace I could buy one. Us too. My wife got through her 1964 pregnancy on Ann Page fruit cakes. She would hide them in the back of the fridge so that she did not have to share. I sure would like to find one to see if they really are as good as I remember. Someone took over the Eight O’clock coffee brand and is doing great. Maybe someone can do the same with the Ann Page fruitcakes. A & P disappeared from Louisiana and Texas many years ago. It is amazing how their store brands live on.